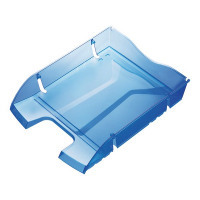 This recycled Helit letter tray features a sloped front that allows for the easy insertion and removal of documents. Made from 97% recycled PET water bottles, this environmentally friendly letter tray can be used as standalone, or combined with other trays to create a multi-layered system. This blue tray is suitable for A4 documents and measures W289 x D390 x H234mm.